I have two little prayers that epitomize where I seem to be spiritually. The first one is one I learned from Mark Hart and it is, "Lord, I grant you permission to remove anyone--or anything---that keeps me from you." The second prayer is attributed to St. Augustine and is, "Lord, make me chaste----just not yet." You see, I want nothing more than to be a saint and to spend eternity in front of the face of God in Heaven, yet the lure of sin is so great that I seem to desire it more than Heaven. I think there are several reasons for this. The first is the deception of what sin is, provided by the Devil. The Devil convinces us that sin is not that bad, and what people tell me is sin probably isn't really. I mean, who are we really hurting? And who is making the rules up anyway? Who are they to tell me that something is wrong. I'm the one who knows best about what's right or wrong for me. The reality is of course, I'm ignorant when it comes to most things much less theology. Should I really trust my eternal soul on my own opinion when I don't even know how the combustion engine works much less even begin to understand the inner thinking of God, who created the universe? We are blessed that God gave us the Church to guide us and help us, with the help of the Holy Spirit, to become saints. They second lure of sin is that, lets face it, sin is so much damn fun. I enjoy a good snarky comment that zings someone. I enjoy finding the good juicy gossip on someone and I certainly enjoy complaining about someone and telling my friends how dumb someone else. And don't even get me started on attractive women---they are pleasing on the eyes. Even when I know things are a sin and understand why a certain behavior or act is sinful it is so difficult to turn away and and do what is more pleasing to God instead of what is pleasing to Jamie. Those chains of sin are strong and very difficult to break. But it's not impossible. As I've matured, I've broken some and the lures of certain sins are as attractive as they once were. Finally, I don't think that, as humans, we are more in touch with our physical sides and not so in tune with our spiritual sides. 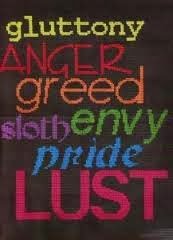 As such, I don't think we are aware of the damage that sin causes us. When we sin, we turn away from God. We are walking away from Him. So, the real price of sin is death. So, if I die in a state of mortal sin I've destroyed my relationship with God and I've sentenced myself to eternity without His love and without being in His presence. Fortunately, God loves us and wants us to be with Him. So much in fact that He became a man Himself and became the ultimate sacrifice for our soul. Fortunately, He is merciful. Fortunately, he gave us a way for us to repair that relationship with us in the sacrament of reconciliation. God knows me. He knows that I love Him and want a relationship with Him. He also knows my failings and how desirable I find sin. He gave me the Church to lead me and to help me better understand sin and not be fooled by the Devil. He gave me the Church to help me break those chains of sin. He gave me the Church to that I can receive that sacrament and be reconciled with Him. So, yes Lord, remove anyone or anything from that keeps me from you---and do it now, because I do not want to ever be separated from you.